The Microsoft OneDrive app for mobile is an extremely effective app for both backing up photos and consolidating photos and videos from all your devices to a single place. Let’s review how it works and how to set it up. It’s rare these days to take photos and videos with anything other than a phone or tablet. As straightforward and convenient as this is, however, backing up photos and making them easy to share is an entirely different matter. That is until I started using Microsoft OneDrive. Sounds great right? Let’s review the simple steps. First, we’ll start with Android. Download and install the OneDrive app for Android. When you initially set it up, it will ask you if you want to back up full-resolution photos and videos to OneDrive automatically. Go ahead and turn it on. By default, they will only upload over Wi-Fi, but you can change that if you want to for some reason. One thing to keep in mind when enabling this on Android, your Google+ and Photos apps might already be automatically backing up photos to Google Drive too. Be sure to disable this if you’re going to use OneDrive instead. Moving along to iOS, you need to download the OneDrive app which works on both the iPhone and iPad. We’ve written up detailed instructions for the iPhone and iPad however, in summary, the first time you launch it on your iOS device (iPad in the shot below), it gives you the option to save all of your pictures to OneDrive automatically. By default, it will only upload your photos and video when you connect to Wi-Fi. It’s probably the best choice to leave it that way, so you don’t get overage charges on your data plan. Note: The iOS OneDrive app allows an extra 3 GB of storage too. However, it looks like this trick only worked after I added it to Android. If you already have OneDrive App Installed and want to save your photos to OneDrive, launch it and tap Me > Settings > Options > Camera Upload and turn it on. One thing I love about uploading your Mobile device photos to OneDrive is they will all be centralized and viewable (and shareable) on the OneDrive website. 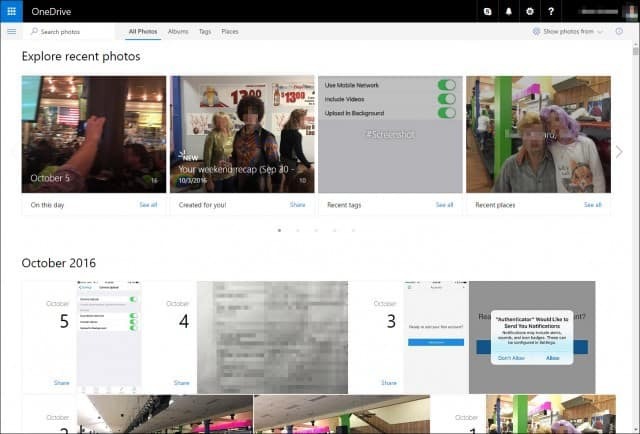 Microsoft has been doing a fantastic job of updating the site to make it easy to view all your latest photos and even auto-tag your photos and create albums for you. If you’re a Windows Phone 8.1 owner, you’ll be asked to back up photos (and other phone data) to OneDrive during the initial set up. To make sure everything is being backed up to OneDrive, and the quality of your backed up photos, go to Settings > Backup > photos + videos. There you have a few options on what you want the quality to be. I always change mine to Best quality for both; because the file sizes will be larger, Windows Phone will upload them only when you connect to Wi-Fi. The benefit of using OneDrive on your smartphone(s) and tablet(s) versus iCloud or Google Drive is you can view and organize your photos from more locations and devices and as I mentioned earlier, you can easily see and share the photos online. What are your thoughts? Are you using a trick to backup all your mobile photos and videos? The app for iOS has a really low rating & lots of complaints. The most common being the latest version has a login bug & is not allowing access & the automatic back up of videos without the ability to control that option. That would be understandably problematic since video files are usually huge & would eat up a lot of the free space allotment. I was also concerned about complaints of no ability to search for specific files & requiring location services to be turned on in order to upload & not being able to empty the cache without having to delete the app (a cache that can take up gigs of space!). The idea is great but it sounds like implementation is shoddy. I think I’ll wait until an update is released that fixes some of the reported issues. I stand corrected. I decided to download the app & see if I had any problems. I was able to login & I didn’t see OneDrive in my list of apps that request to use my location so no issue there. The videos thing is still a problem & I’m going to see what happens with the cache over time. Yes. It’s under the settings now. You can turn video upload on or off. How do I make my OneDrive app (android) only upload photos I choose? I don’t want to upload every single photo I take. Choose where you want to upload the pictures to, tap the Upload button and then tap Upload photos and videos. Choose the files you want to upload and tap UPLOAD. Thank you, and that does make sense, but I want to upload ONLY the photos I want to; that is, NOT automatically upload every single photo I take. How do I set it to do that? I don’t think the app today has that feature set. You can include videos and configure it to upload only on WIFI vs. using your data plan but that’s about it… I’ll take a look but like I said, I’m pretty sure that’s not possible yet. Dropbox is the same way unfortunately. All or none. The app has had a lot of updates over the past two years. It now includes the options (Under the Camera Upload Settings) to either include or exclude video files. So, that problem should be solved for you. That’s unfortunate because I take a lot of templrary pics wifh my phone for convenienceve that I don’t wish to keep. Kind of like “picture memos” (for lack of a better term). I’ve uninstalled it for now. I will re-install when/if they add functionality to upload on demand only. Hmm.. I would still recommend you keep the app installed and uploading. It’s easy enough to blow away the junk you don’t want from your PC or MAC once you get to a real machine. That’s what I do. My wife and I both share a OneDrive account on our mobiles so our images are backed up. I end up going through it every few weeks and nuking all the junk. The good news is, if I lose my phone or it dies (it’s happened……), all the pictures of the kids aren’t lost. Because I have 1TB of space (O365 Customers get 1TB of OneDrive Storage), I never delete anything I take. However, it’s easy enough to do this now from the WebApp. You can do multi-select and quickly delete photos you don’t want to keep. That’s also a nice way to create albums quickly as well. But that’s not what I’m looking fir. It’s not so much that I want to upload certain pictures. I was hoping to find a setting so that the one drive app DOES NOT automatically upload every picture I take. I take photos with my Android phone and have it set up to transfer all photos to OneDrive. Works like a charm. I have a new Canon camera with wifi. I have it linked to my phone. From the phone I can select photos on the camera and bring them to the phone. I know this seems complicated, but trying to explain why is complicated too so I will skip that. The photos taken with the phone transfer automatically to OneDrive when there is wifi but the photos transferred from the camera to the phone don’t. Is there a phone setting that would result in the photos transfered to the phone from the camera moving automatically up to OneDrive? Hmm… not sure Ken. I’m thinking it might be an issue with the Canon App. I had a similar App on my Underwater Camera. Worked for a while but it was pretty buggy. I’m under the impression this article was written by somebody who works for Microsoft OneDrive as that is the only reason somebody would promote such a terrible product. The fact is that OneDrive is the worst of all the cloud services! It doesn’t upload burst photos like Google Photos does. Also, it renames your photos so that you can no longer compare them to the original on the device. A cloud service should never ever rename a file. The job of a cloud service is to keep an exact replica of what is on the device. The job of a cloud service is not to rename your photos, but OneDrive does this without your permission. Google Photos on the other hand does not rename your photos. There are so many problems and difficulties with navigating the app (for example, try selecting all the photos in the trash bin so you can delete them all at once – nope – there is no way to do something so simple in OneDrive). Meanwhile, Google Photos is a breeze and is extremely easy to use and navigate and yes you can select all the photos in the recycle bin and delete them all at once. Imagine that, simple things that can’t be done in OneDrive can easily be done in Google Photos, Dropbox, etc. Now, turn on upload over cellular data in OneDrive and turn on run in background. Will your photos auto upload in the background? Nope. Because OneDrive is one big epic failure. Now, report these issues to Microsoft and three years later it will be exactly the same with no changes or improvements. One only has to look at the ratings and comments on this app to learn that OneDrive is the worst cloud service of all cloud services! Use at your own peril! Personally I wouldn’t recommend garbage OneDrive to my worst enemy! Hi, Jade – thanks for the comment. I’ll see if I can comment on most of your items you mentioned. 1 – No. Neither Brian nor I work for Microsoft. I’ve been running gP for almost ten years now, and I would never mislead my readers simply because I work for a certain corporation. The comments in the article had no external influence other than our experience with the service. 2 – I disagree with your statements re: OneDrive. Is it perfect? No. Is it the worst cloud service out there? No. The fact of the matter is, OneDrive and Google Photos are two very different services. Google Photos allows for unlimited photo upload storage (unless you want to store your originals). 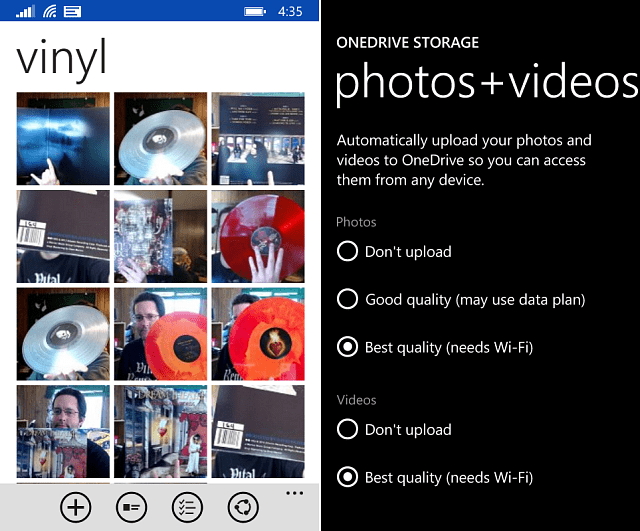 OneDrive allows you to store more than just photos and, it’s not unlimited. You must pay for more space. In other words, with Google, you and your data are the product. That’s why it’s free. With Microsoft, OneDrive is the product. Just read the terms of service for both companies, and you will understand this. 3 – I disagree, per the points above, Google Photos is not a valid product I would ever consider using. This is 100% based on the Google Terms of Service. 4 – Not sure when you tested the OneDrive Photo Gallery app last, however, I disagree that it’s difficult to use. Selecting multiple images is simple. I do it every time I want to create a gallery of the photos my wife and I took with our iPhones. Works perfectly. 5 – I upload photos just fine over cellular. Videos also. I know this because I have an unlimited plan with my mobile carrier so I always keep this option enabled. It’s flawless. Obviously, we don’t agree on this one but that’s fine. Looks like you’re a fan of Dropbox so we can both agree on that. Dropbox is great. It always just works. Unfortunately, I don’t have a free Terabyte of space like I do with OneDrive. So, I don’t use it. Jade, you are a knucklehead. We are all under the impression someone else typed in your comments. Anyone who can’t figure out how to use OneDrive, certainly can’t type that many words. It is as easy as turning on a button. Just read the MS Help Forums (if you know how to) and you will see the amount of people complaining about OneDrive not uploading all your photos, with Microsoft even admitting to this and releasing a fix for it. That in itself is proof that it’s not a reliable cloud service. Obviously you need to learn how to read. Never did I say I couldn’t figure out how to use One Drive, or turn it on with the click of a button. It’s evident that I was able to turn it on if I was able to list all the problems with it. Unlike you, however, I don’t just push a button and trust things to work. I make sure they do before calling something reliable or not. So in the end, who is the real “bigtime” knucklehead in this case? Not all of my photos from my Iphone are uploading to Onedrive, what am I doing wrong? I’ve used this process on 5 or 6 iOS devices and it always works flawless. Here’s a few things to try. – Photos will only be uploaded once. Make sure they were not uploaded once before because they will not upload again. – Make sure you’re running the latest version of the Onedrive app. You might even uninstall it from your device and reinstall it again. – Check the settings of the app. Did you configure it to actually upload the photos? Is it set to WIFI only? Do you have a good WIFI connection? I would start there. Let me know how it goes! I’m having the same trouble and I tried uninstalling and reinstalling it. There are still a few whole months missing that are still on my phone. Even with fast INternet connection OneDrive is slow to upload. In my MAC it just spent one month re-syncing 250gb. Why? Because I dared to move a folder. Microsoft just just give up. To be fair, the vast majority of users out there have extremely, fast download but VERY slow upload. If you run a speedtest.net test, what are the numbers for both upload and download? Why do you try to justify OneDrive problems so hardly? Do you work at Microsoft? Nope. I don’t work for Microsoft. Just trying to figure out what your issue might be. That’s an extremely fast upload speed. At this point, I’m stumped why your uploads are slow. If you have Dropbox, that’s also another great way to auto-upload your photos to get them backed up. I did that in the past. Just required you to pull them out of the Dropbox folder later if you don’t pay for a lot of storage. From the App on my iPhone I wasn’t able to “Select All”, I had to TAP and HOLD on a Photo (or file) in the Recycle Bin, then it let me multi-select which images I wanted to delete. If I was deleting more than a dozen, I agree that would be a pain. That’s a UI update MS needs to make for sure. What you can do however is open a Browser > Onedrive.com > Recycle Bin > Select All > Delete. Requires you to go into the Web version but it’s a workaround I guess for now. That is a great useful post. Can we also get back my photos, once deleted from OneDrive? And if deleted from the device then? OneDrive is a great idea but unfortunate it rarely works correctly and when it does it is painfully slow. I started using OneDrive years ago on my desktop and it worked pretty good. Unfortunately through the years it just keeps getting worse. On my iPhone it is stuck on “setting up” for hours and rarely uplaods anything. Hello Steve! If I take a photo with my iPad, and I am not connected to the internet at the time, will it get uploaded later? Yup – they will queue up and wait until you are back online then auto-upload the photos. Works like a charm on all my devices. Thanks for your reply, Steve ! In OneDrive there is an option that says “upload in background “. Do I need that? So far One drive has been great on my android smartphone. I recently started using it on my wifes iphone, but there is no way to keep the automaticaly uploaded photos separate. Under options I can only specify what to upload but not where to on the one drive. There’s not a way to do it auto…. You will need to manage it after it uploads to OneDrive. Not perfect but also not a huge issue if you can spare a few mins here and there. Personally, I create A LOT of albums. You can select multiple images fairly quickly and then just move them into an album. Keeps the photos all well organized and easy to share (and find later). It looks like by default they go to Pictures\Camera Roll and there doesn’t appear to be a way to change it. It seems in order to turn on ‘upload in background’ you need to have location services enabled? Have you found that as well? I keep the location services off unless I’m using them to save battery. I’d like to switch from backing up my photos to iCloud to Onedrive. 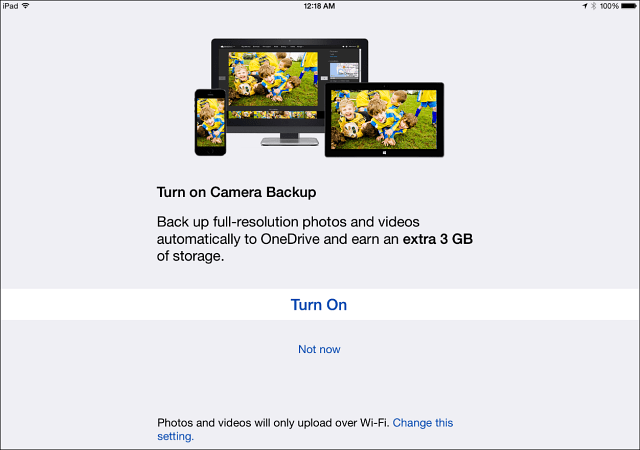 I already use Onedrive to backup my camera photos so keeping everything in the same place makes sense. Also I’m running out of space on iCloud and I don’t want to pay for storage twice. I am having difficulties with almost a year’s worth of camera uploads disappearing and now OneDrive keeps telling me there are no photos to upload, although I have taken some this week. For MS to investigate, I have to identify all the file names that are missing. That’s probably a week’s work. This is great! Thanks for writing this post. I’d been trying to use third-party photo-sync apps, but found them to be mostly manual and not very intuitive. Using OneDrive is much cleaner. Yup! I delete my iPhone photos all the time. It’s a great solution. Glad we were able to assist Chris! Any sugestions how to correct that? Thanks in advance….